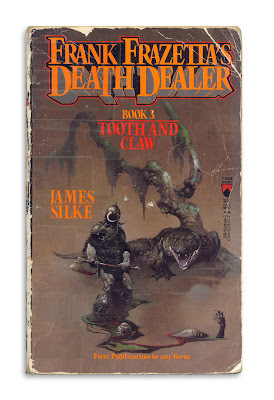 "Frank Frazetta's Death Dealer: Book 3: Tooth and Claw." Published by Tor, 1989. Looks like Death Dealer has seen a few reads, must be a classic. Hahahahahah! Hah! Heehee. Whew! 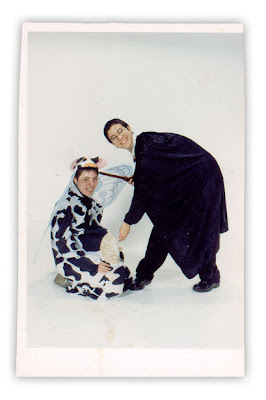 Harry Potter milking a cow. In a book so nerdy you couldn't have made up something better. Are you sure this wasn't a plant? i swear on all that is holy. 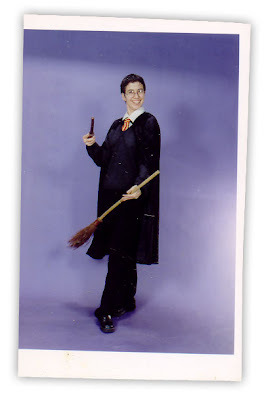 besides, where would i even find photos like this? i do admit, its almost too good to be true. Oh...my. So strange, so very, very strange. Wow, I didn't even know that artist Frank Frazetta wrote books. Being very familiar with his artwork I can only imagine the type of overwrought prose he must have produced. 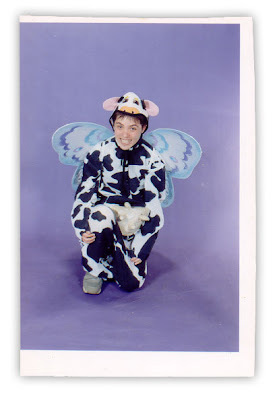 The fairy cow costume is like nothing I have ever seen before. Is that a hat or a mask perched on top of his/her head? I think the novel was written by James Silke based on a character by Frank Frazetta, who was, as Laura Jane notes, a painter. I think the first dude IS the Death Dealer! !